By Dr. Jessica Kerzner, Psy.D. Professional and practical tips for love, relationships, parenting, living life to the fullest, self-improvement & more. Start living a life full of blessings, impact and purpose. Improve your overall happiness, effectiveness, relationships and mental fortitude with Author, Psychologist & Speaker/Trainer Dr. Jessica Kerzner and guests. Dr. Kerzner delivers straight talk with humor and simple strategies embedded with God and Psychology (with southern charm) so that every episode gives you a burst of excitement for your PURPOSE in life and steps to attain it AND walk it out. Many wonder what do I do after I get relief from clinical depression or anxiety? How do I move forward? What should I expect? What do I do? 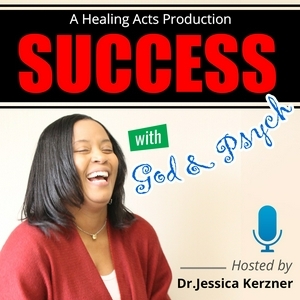 Dr. Jessica Kerzner answers these questions and more in this episode of Success With God & Psych!! Dr. Jessica Kerzner has invited special guest Rick Peterson to share his POWERFUL story of overcoming abuse, drug addiction, failed attempts at getting therapeutic help and feeling torn with wanting to live. Forgiveness is hard. Forgiving others and forgiving ourselves. How do we begin. it's it truly possible to forgive. Dr. Kerzner talks about it. We often wonder why do we have to die and what happens the moment we die and after we die. Dr. Jessica Kerzner gives a take on it in this episode. How to find Love? What does it take to find love in the digital age when everyone is on their cell phones, tablets and computers? How do you go on a date, meet someone, fall in love when the internet is between you??? Dr. Kerzner talks about it in part 1 of How to find love. listen now!!! Talking negatively to yourself can destroy inner motivation, decrease your mood and tear you down. Dr. K discusses why positive affirmations are important in the Healing Acts Focus Me Minute 60 second radio program. It can be difficult to stay true to yourself while going after your goals. How do you refine yourself with the people you admire and still retain your uniqueness? Dr. Jessica Kerzner gives tips in this episode. When fear has you paralyzed you can push through and overcome it. Dr. Jessica Kerzner talks about 3 things you can use to fight yourself and stomp on that fear. The premier episode. What do you do when you are working hard and you are not seeing the progress you hoped for. Rough quality but still informative!! Sometimes life gets VERY hard and we are going through a situation that it is hard to believe that there is a way out of or that there is a positive end. Can we channel faith or hope in those situations? Dr. Jessica Kerzner discussed faith and hope and the current situation with the Thai boys trapped in a cave with their soccer coach. Do you want to feel happy everyday? Studies show that there are ways we can increase our happiness and decrease stress, pain and increase immunity. Listen to Dr. Jessica Kerzner review tips in 60 seconds in the Healing Acts Dr. K's FocusME Minute radio program. It can be a daunting stressful task making decisions. There is a way to make the decision systemically and as informed as possible. Let's talk about it in 60 seconds with Dr. Jessica Kerzner. Life struggles can be overwhelming. It can be difficult seeing the way out and having hope. 60 seconds on what can you do to shift yourself from Dr. Jessica Kerzner. Let's talk candidly about why parenting is SO HARD. Part one of a conversation saying what most parents won't say. The words we speak and hear can build or destroy. Why is it important to speak selectively? How do our brains take this information in? Where did this start? Dr. Kerzner answers these questions and more. Dr. Kerzner begins this series on Love discussing what is Love? Do we know? Guest Dr. Carolina Grullon weighs in on what is needed for a solid foundation of love in a relationship. So many people report feeling alone, isolated, and finding it difficult to connect with others. In a time where people have so many options though technology to remain connected.... why is this being reported in such large numbers? What can we do to change it? Dr. Kerzner weighs in on the why and gives suggestions on how to remedy this for yourself. Dr. Kerzner answers listeners questions about parenting. Let's talk about reputation!!! Dr. Kerzner has a conversation with Real Talk Coach Marc White about is your reputation important and if so how do you protect it. Dr. Kerzner reads tweets with the hashtag #godisreal & #depressionisreal and discusses them. Dr. Kerzner addresses recent events with Kanye West and his Trump comments on Twitter. Dr. Kerzner has special guest Pastor Lorenza Bell on to talk about social media posts and how to be passionate but open to others experiences. Dr. Kerzner answers emails and calls related to dating and relationships. Dr. Jessica Kerzner answers random questions from Healing Acts family.